This year is the new edition of the Weekend Beach Festival in Torre del Mar. 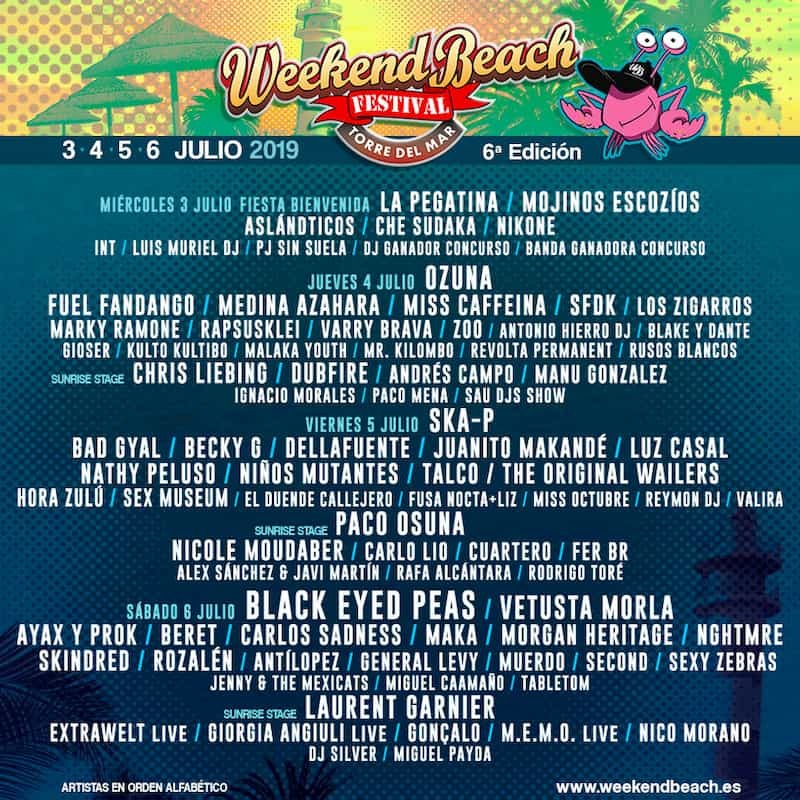 A beach concerts festival that will take place from 3 to 6 July on the shores of Velez-Málaga. Although there are still a few months left before the start of the festival, the official poster has already been presented with the artists who will have an appointment during the event. Reservations are open for everyone. This festival has established itself as one of the most important in the musical agenda of the year. Artists of the size of The Prodigy, Sepultura, Estopa, Mago de Oz were present in past events…. The last confirmation for 2019 comes from Black Eyed Peas and The Original Wailers. This festival can be a good excuse to visit this beautiful municipality of Velez-Málaga. Once you have the bracelet of the festival you will have free access to it, being able to go out and enter as many times as you want. Torre del Mar is a tourist destination that stands out for its location and gastronomy. Especially linked to seafood and the famous’ pescaíto frito‘ (fried fish). Delicious skewers of sardines that you can order at any beach-restaurant (chiringuito). 6 kilometres of high quality beaches, a seafront promenade with many restaurants and beach bars with a wide culinary offer. From Malagaweb we recommend trying fried or grilled ‘rosada‘ and ‘adobo‘, two delicious dishes that you will want to repeat. But…what is the Weekend Beach Festival? You still don’t know the Weekend Beach Festival? It is a 4-day festival with live music that takes place in Torre del Mar at the beginning of July. This year is the fifth consecutive that takes place in Malaga. A characteristic feature of this festival is its usual camping area for tents and another for caravans. This year it will be open from 4 July at 10:00 am until 7 July at 7:00 pm on Sunday. The camping area is protected from the sun and is only 10 metres from the stage where the concerts take place, on the Poniente beach. It also has all the necessary services to enjoy the activity: showers, toilets, mobile phone recharging, surveillance and access control, health care and cleaning service. The camping area is only accessible to people with identification and pets are not allowed. The area dedicated to caravans offers the users a space for placing their vehicles and gives access to the services of the camping area. Unlike the camping area, this area is not protected from sunlight. If you want to visit any of the tourist attractions in Malaga you can use public transport or a taxi. From our website we recommend where to order taxis for up to 19 people (or even a bus for 54), so if you form a good group the price will be quite cheap. How does it sound to visit Sierra Nevada for just over 15 Euros? And Nerja for just over 6 euros? Undoubtedly one of the advantages of the festival and its camping area is that you can organize excursions at a very good price. Another option is to use a minibus to get to the festival in group at the best price. There are options for 5 and 7 passengers. In addition, if you need more space, there are buses with 8-12,13-19,20-26 and 26-54 seats for groups. The greater the number of people, the lower the price to pay per person. You can book a round trip with a 10% discount, they will pick you up where you specify at the exact time. http://www.malagatransfer.co.uk offers minibuses and buses for all needs. Children under the age of 18 are allowed to enter if they have a signed authorization. Minors under 16 years of age must be accompanied by a legal tutor. The VIP entrance has parking, access to VIP area and a merchandising pack of the festival. In the contest of bands and DJs of Torre del Mar, if you get to be one of the most voted, you will have a place to perform during the festival along with well-known national and international names. It will undoubtedly be a good push in your career. In addition to this succulent prize, you will be able to do the Master of Musical Production, Mixing and Mastering in a school. The only requirement is not to have any record released under discographic contract. Inscriptions from 11 to 25 March. Voting from 26 March to 16 April. The winner will be published on 19 April.